San Jose Sharks center Joe Thornton is quite confident that his team has what it takes to go very far in the upcoming Stanley Cup Playoffs. Center Joe Thornton senses a renewed swagger within the San Jose Sharks dressing room these days. A franchise-best, 11-game winning streak and League-best 25-8-3 road record aside, Thornton admits the Sharks possess a confidence unlike any other he's experienced in his two previous seasons on the West Coast. "I feel like we're peaking at the right time," Thornton said. "Our confidence level is as high as it possibly could be right now. There's not one particular thing that's going incredibly well; we're just playing every game real solid. We've been playing some good teams and if we get a lead after two periods, we really have learned to shut it down." Thornton, now in his 12th NHL season and third with San Jose, is well aware of his team's 30-1-2 mark when leading after two periods. He also points to the players' willingness to sacrifice offensive numbers late in games in order to seal the deal in their own end as signs of a team on a mission. With newly acquired defenseman Brian Campbell and veteran goalie Evgeni Nabokov in the fold, the Sharks rank third in the League with 21 one-goal victories. Thornton has played his part as well, scoring two goals and adding 10 assists in his last 10 games. Additionally, Sharks captain Patrick Marleau (16 goals, 22 assists) has five points over the last six games and Jonathan Cheechoo (22 goals, 13 assists) has produced seven points in his last seven games. "I think our mindset is different this season," Thornton said. "We know what it takes to get over that hump. That's something we struggled with the past two years. I love our toughness, our speed and our goaltending. Our confidence is high at the right time of the year. I really do like this team a lot and am looking forward to the playoffs." Perhaps, as Thornton suggests, there was something missing from the previous two playoff seasons in San Jose. In 2005-06, he played 33 games with Boston before being traded to San Jose on Nov. 30, 2005, and finished the regular season with 29 goals and 125 points. He was awarded the Art Ross Trophy as the League's top point-producer and Hart Trophy as NHL MVP following the season, but the Sharks were eliminated in six games by Edmonton in the Western Conference semifinal round. Last season, Thornton racked up 92 assists and 114 points in 82 games before the Sharks again dropped a six-game series in the Conference semis, this time to Detroit. This season, Thornton is at it again. He is tied for sixth in the NHL scoring race with 83 points (19 goals, 64 assists) and leads the NHL in assists. 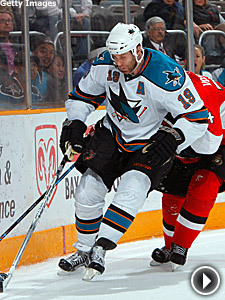 Thornton, who centers the top line with Cheechoo and Milan Michalek (23 goals, 25 assists), has scored 289 of his 743 career points playing in San Jose. "Right now, so many different guys are running with hot streaks so it's been exciting," Thornton said. "We really like to think of ourselves as a good defensive team, so that's what we pride ourselves on. We feel comfortable in those 2-1 games and know that's how we're going to have to play in the playoffs to be successful. We don't really take pride in scoring a lot of goals; we take pride in keeping the goals out of our net. That's how we win hockey games." The Sharks (42-21-9) are currently seeded second in the Western Conference and also lead the Pacific Division. Since coming over from Buffalo at the trade deadline, Campbell has two goals and nine assists in 10 games, and Nabokov leads the League in victories (41-20-8) and total minutes played (4,131). He recently earned his 200th career victory in a 3-2 decision over the Chicago Blackhawks. "Evgeni is the backbone of our whole team," Thornton said "He's been playing unbelievable and is a workhorse. When he's in net, we really do feel like we have a good chance of winning every night." Campbell, who is Thornton's roommate on the road, has been a huge boost to the transition. "He pushes the pace of the team," Thornton said. "He's the kind of guy that makes our offense tick. He skates so well that he moves opposing defenders back to open up more offensive space for us. I think, just by watching him play, move the puck and skate, he teaches our younger defensemen. It's just contagious and he's making a huge difference." It also helps to be playing well on the road, and no team has been better than the Sharks this season. "Obviously, we have to win on the road in the playoffs," Thornton said. "We have a great group of guys that like to hang out together and that adds to our record. Feeling comfortable and playing well on the road now is only going to help us in the long run." Contact Mike G. Morreale at mmorreale@nhl.com.